I have been working long and hard for about 6 months maybe longer (I could be in denial) on my Scrap Closet. 1st step was to remove all the stuff I wont use. 2nd step was to decide if donation or selling items I wont use??? 3rd step was to decide if I liked items and again sell or donate??? Next was as I bring stuff in is it personal or business or will I really use it? I know tons of decisions on just stuff just to start this process. Today I am showing my SU stamps and how I organize them. Also while doing the above I was transferring my SU stamps to the new storage solution as I had run out of storage for my stamps and the shelves I loved were no longer available. Then it was build or buy??? We did opt to buy the storage shelf but eventually I think I will want to make one that fits a bit better for my needs. 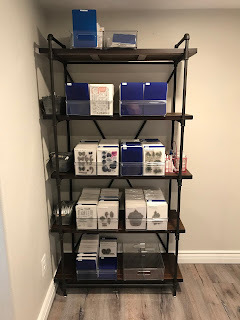 I believe I only have space for about 100-150 more stamp sets on the shelves so I have about a year or slightly more if I don't go too crazy. New storage Shelf purchased at Hobby Lobby ) Saw it after class and went home got dimensions etc and then went back the next open day and got it. The top shelf holds some of my other brand stamps. 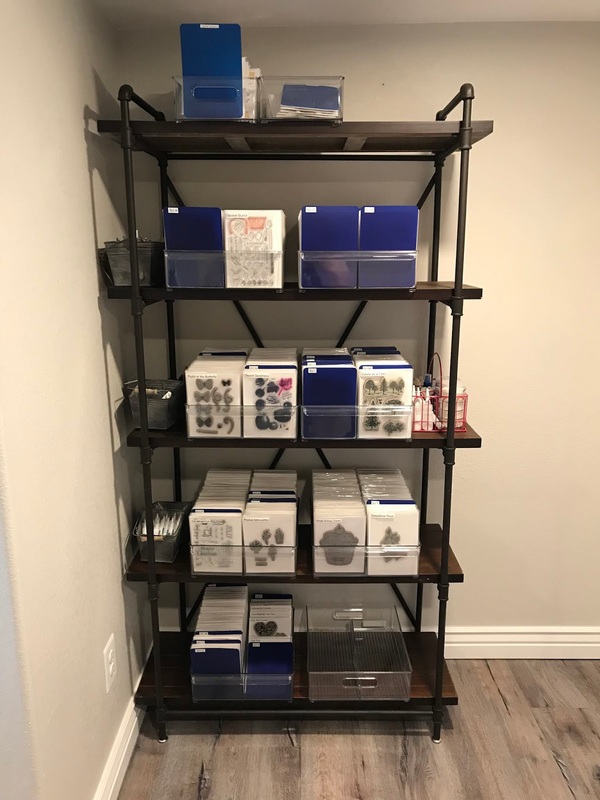 The rest of the shelves are Stampin up. 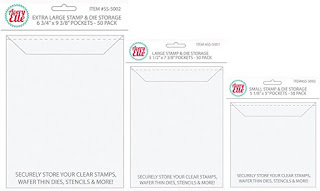 Tubs to hold stamps are from Interdesign purchased at Bed Bath and Beyond and Amazon. 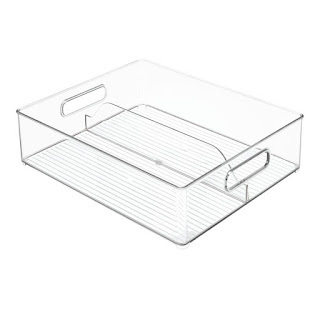 I have 2 different styles of these bins one has a drawer handle on the front and the other is like this picture. Personally like the drawer handle version but they are getting harder to find. I mainly use the middle one (Large) and I have found with my Stampin up stamps and Lawn Fawn stamps with matching dies this works for every size they offer. The larger size works great with Graphic 45 from Hampton Arts, and a few other companies I have that just give you a big old sheet of stamps. These are stored in the wider boxes at the top of my stamp shelf. Then came the huge problem of knowing what I had. The old system I had the spine of the stamp set and a vague amount of info on the spine of the ones I transferred from wood mounts. The new system is a bunch of packets in a tub. Hmm what to do??? Of course I googled storage stuff and help which led me to Evernote - Godsend I tell you. 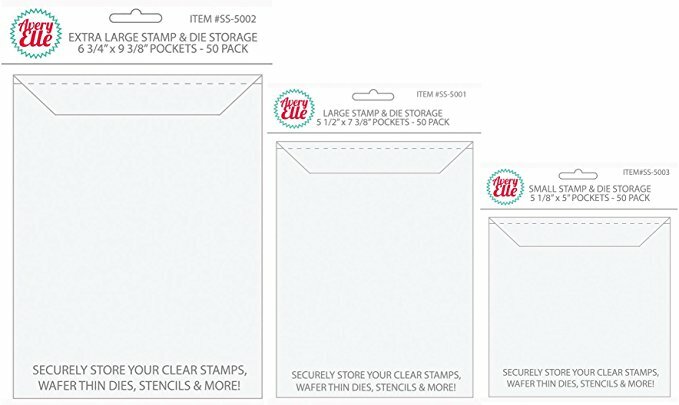 All my SU stamps, dies and embossing folders are now in Evernote for a quick and easy look and find what I need system. It was and is a time consuming process I wont lie it had taken me months to change out the sets and get them in the system. The months where I was part in and part out were horrible. I couldn't find anything and I was so frustrated. I am now in a better place of "closet and online organization".